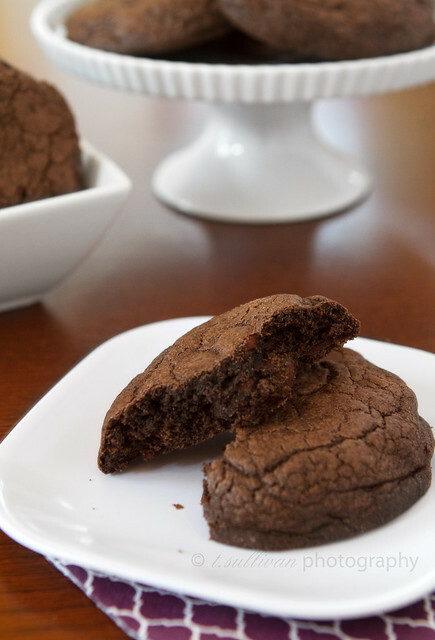 I’ve always wanted to find a good double chocolate cookie recipe. These cookies are a bit bigger than what I had in mind, but when have I ever complained about a cookie being too big? Never. The important part is that they’re soft, rich, and tender on the inside which is exactly how I like my cookies. These cookies aren’t the prettiest. They’re very brown. But what they lack in aesthetics they make up for in chocolate. Lots and lots of chocolate. If you’re craving chocolate, these are sure to hit the spot! After they’ve cooled, you can zap these cookies in the microwave for about 15 seconds to get them warm and melty again. Heaven. Preheat oven to 350°F. Line two baking sheets with Silpats or parchment paper. In a medium bowl, whisk together cocoa powder, flour, salt and baking powder. In the bowl of an electric mixer with paddle attachment, cream butter and sugar until light and fluffy. Add eggs and vanilla, and beat to incorporate. Add half the cocoa powder mixture and mix on low speed until no longer powdery, then add remaining half and mix until incorporated into a stiff dough. Fold in chocolate chips. Turn out dough onto a piece of wax or parchment paper. Shape into a disc or rectangle and divide into 12 even portions. Roll each portion into a ball (a bit smaller than tennis ball sized!) and place on prepared baking sheet, 6 to a pan. Flatten each ball slightly with hands or the back of a glass / measuring cup. Bake 16-20 minutes, or until edges are set. Cool 5 minutes on pan, then transfer to wire rack to cool completely. Store at room temperature in an air-tight container. I have been craving chocolate all day and then I see these…its official, I am baking this weekend. These look terrific! Rich and chocolaty, what could be better? these look so good.. but could I use a hand mixer if I don’t have a mixer with a paddle attachment? I’m not sure. You could certainly try it! It does make a pretty stiff dough though (like a chilled shortbread), so a hand mixer may not have enough power. If you think power might be a problem, maybe you want to make yours with slightly softened butter and then refrigerate the dough before baking. If you try it, let me know! Those look heavenly and like a way to use up our dark cocoa powder. these look amazing… can’t wait to try them. Has anyone tried adding nuts??? Let me know.